My dreams are many, but the one that tops my list is becoming a multi-published, best-selling career author who will take to the road and speak to audiences across the world on the subjects I love to explore and write about. When I started pursuing this endeavor in 2009 in a major leap of faith, I figured that the best way to pursue that dream was to go full force at it. I figured that I would just start trying to become an author. So, I wrote my nonfiction book proposal, built a list of agents to send it to, sent out my queries and proposals and… got rejected by almost all of them. Listen, pursuing dreams is supposed to be tough. Remember what Randy Pausch said in The Last Lecture: brick walls exist for us to prove to ourselves and others just how badly we want our dreams to become realities. Adhering to my own advice that life and our pursuits are far more about the journey than the results, I’ve come to genuinely enjoy the hard work of the process (after loathing it for quite a while). Even still, that seemingly distant end-goal — becoming a hardcover rock-star of epic authordom — remains in the forefront of my mind. How could I continue to pursue that goal without repeating the same unproductive process as I had tried earlier (and without slamming my head into my dreams’ brick wall) along the way? More importantly, how can YOU pursue your biggest and loftiest dreams without falling by the wayside? Dream-Hitching is the practice of attaching your hugely ambitious, seemingly “far-off” dreams to an endeavor that you can begin and run with right here, right now. Dream-Hitching means using other, quicker, cheaper, and more immediately productive means to build forward momentum. The goal is to latch your “big picture” dream to something that’ll help you eventually get there. Along the way, Dream-Hitching starts the snowball effect that helps to carry you forward. Many blogs (probably your own, like mine!) serve this very purpose. You began a small and inexpensive personal website to generate a following and spheres of social influence to (if only have the chance) to leverage something bigger down the line. Dream-Hitching doesn’t make the distant dream of yours immediately achieved, but provides you with the means to begin working on it right now and working toward it right now. DaveUrsillo.com is one act of Dream-Hitching. And now, I’m thrilled to announce a further development in the grand scheme of my dreams of becoming a super-badass career author (and part-time undercover superhero, but let’s just focus on one step at a time): RenegadeGuides.com. RenegadeGuides.com is my new online store that — as the name implies — will provide you with awesome guides (manifestos, programs, courses and more) on how to be a better renegade in your everyday life. The topics of those guides will largely be dictated by what you, my tribe, want to learn the most. I envision RenegadeGuides.com as providing some incredibly special books to inspire better living and especially to help you become a catalyst of happiness, positivity and love for others. 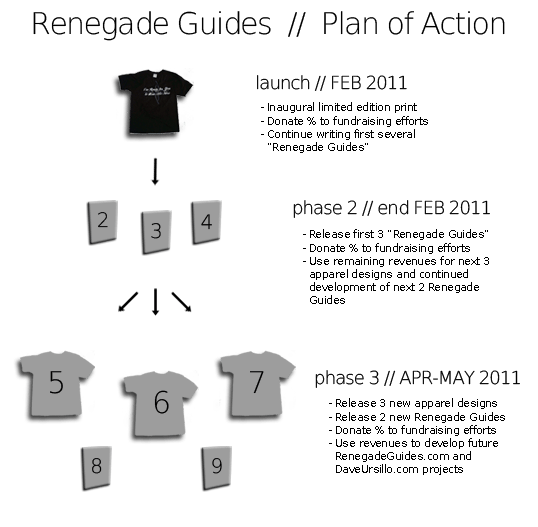 RenegadeGuides.com will also feature original apparel with motivating slogans and awesome designs to brandish your renegade attitude in style. RenegadeGuides.com is a completely ground-up operation. I’ve included a business Plan of Action below for you. We’re going to start small together, because starting small right now is better than starting later, or never — Dream-Hitching, remember? I’m asking for your help with RenegadeGuides.com — and that doesn’t mean just asking for your money. Firstly, I’m going to be offering special discounts and coupon codes — right on Renegade Guides’ own Coupon page — to help you save your hard earned money. Secondly, I’ll be donating a percentage of every purchase to charity (to start, I’m thinking of the Run To Home Base 9K Road Race). Last year, I donated hundreds and hundreds of dollars to nearly two dozen charities, nonprofit org’s and fundraisers. I want to double the number of charities I donate to in 2011. Your dollars not only support me, but will go to some incredibly noble causes across the globe. I’m asking for your help by promoting products you enjoy to those in your social circles who might be interested in them, and especially for your helpful input on the future development of apparel designs and, particularly, the actual Renegade Guides. Is your blog an act of Dream-Hitching? How? Do you Dream-Hitch in other ways? If not, how can Dream-Hitching help you move toward your huge goals?